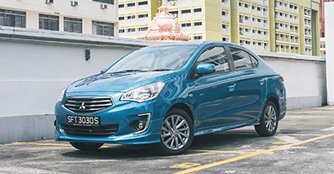 Mitsubishi's small sedan is a decent little city car that sets out to do what it is meant to do well. Mitsubishi isn't pulling any sucker punches. As a car company that is making a comeback, the tri-diamond brand has taken bold steps to tone their local vehicle lineup in lieu with the current trend of engine downsizing and the focus on developing fuel efficient cars. And so, the Mitsubishi Attrage was born. Competing with compact favourites such as the Chevrolet Sonic, the Honda City, the Nissan Almera and the Toyota Vios, the Attrage is also known as the Mirage or Mirage G4 in other markets. Measuring 4,245mm x 1,670mm x 1,515mm (L x W x H), the Attrage is bigger and more practical than its hatchback sibling (not available in Singapore) but smaller than most of its other rivals in the market. In most cases, stretching a hatchback to form a sedan isn't the most recommended design direction. 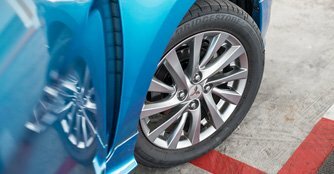 But with the Attrage, Mitsubishi's designers have successfully eliminated that particular hatchback-to-sedan stigma with a nice profile that flows nicely from tip to tip. 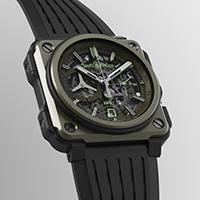 On first glance, the styling elements seem to be influenced by Asian tastes. The Thai-made car has a larger chrome radiator grille along with air inlets to provide cooling for the engine and the front bumper is fitted with fog lamps that have a C-shaped chrome accent on each corner. It also has sharp-looking head lights and the hood is incorporated with lines that make it look a bit more mature and sophisticated. VES - How does it affect you as a car buyer?